With LTE-A getting ready to meet the IMT-Advanced requirements and fulfilling the role of promised '4G', we believe the next phase of evolution before 5G will be successful interworking of LTE and Wi-Fi networks. 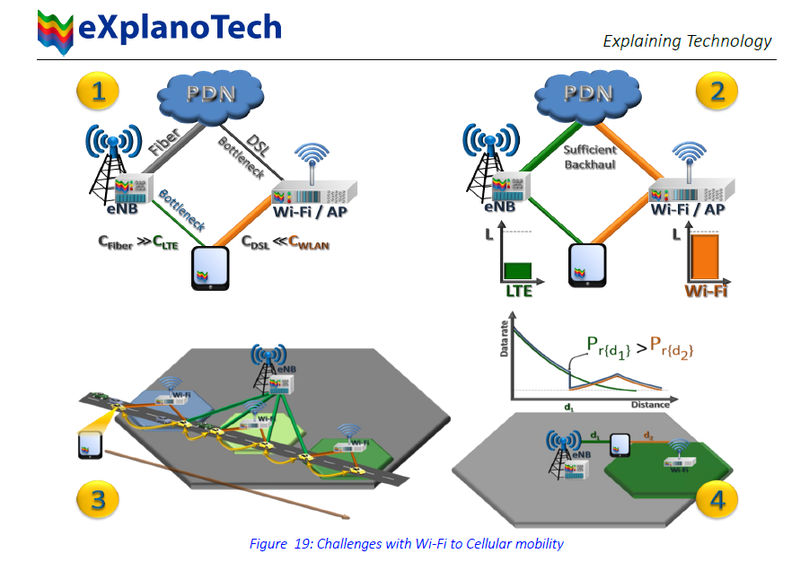 This whitepaper (embedded below) explores this feature, we call 4.5G, in detail. We are very thankful to Anritsu for kindly sponsoring this whitepaper. They have their own whitepaper on this topic which is also worth a read, available here. All networks and mobile devices are required to utilize a common access point name (APN) for VoLTE, namely, “IMS”. Unlike many legacy networks, LTE networks employ the “always-on” conception of packet connectivity: Devices have PDN connectivity virtually from the moment they perform their initial attach to the core network. During the initial attach procedure, some devices choose to name the access point through which they prefer to connect. However, mobile devices are not permitted to name the VoLTE APN during initial attach, i.e., to utilize the IMS as their main PDN, but rather to establish a connection with the IMS AP separately. Thus, VoLTE devices must support multiple simultaneous default EPS bearers. As stated, VoLTE sessions employ two or three DRBs. This, in turn, implies the use of one default EPS bearer plus one or two dedicated EPS bearers. The default EPS bearer is always used for SIP signaling and exactly one dedicated EPS bearer is used for voice packets (regardless of the number of active voice media streams.) XCAP signaling may be transported on its own dedicated EPS bearer – for a total of three active EPS bearers – or it may be multiplexed with the SIP signaling on the default EPS bearer, in which case only two EPS bearers are utilized. My understanding is that initially when the UE is switched on, a default bearer with QCI 9 (see old posts on QoS/QCI here) is established that would be used for all the signalling. Later on, another default bearer with QCI 5 is established with the IMS CN. When a VoLTE call is being setup, a dedicated bearer with QCI 1 is setup for the voice call. As the article says, another dedicated bearer may be needed for XCAP signalling. If a Video call on top of VoLTE is being used than an additional dedicated bearer with QCI 2 will be setup. Note that the voice pat will still be carried by dedicated bearer with QCI 1. Do you disagree or have more insight, please feel free to add the comment at the end of the post. The whitepaper is embedded below and is available to download from slideshare. I have blogged about the Anritsu MD8430A here and about their RTD product here. Recently they have become first test equipment vendor in the world to achieve GCF-approved test case validations for both LTE (Long Term Evolution) RF and protocol conformance testing. Here is their Demo from LTE World Summit 2010. 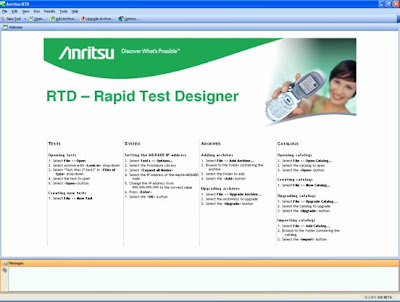 Today we take an exclusive look in this blog inside Anritsu’s Rapid Test Designer (a.k.a. RTD) tool. 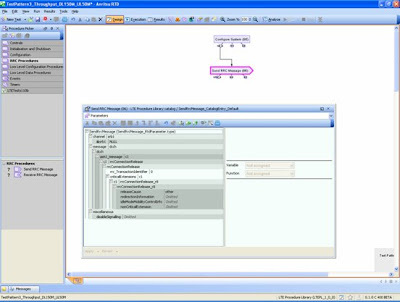 RTD is a very powerful tool that can be used to design LTE tests for R&D purpose. RTD works in conjunction with Anritsu’s MD8430A. MD8430A has not very long back won the CTIA Emerging technology award. 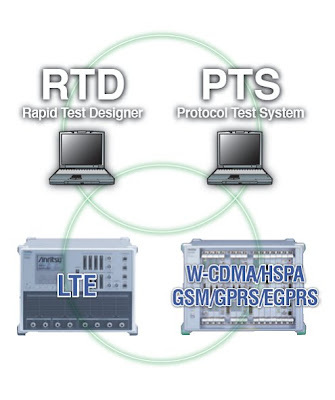 For WCDMA/HSPA testing, Anritsu offered Protocol Test System (PTS) for R&D purpose. For LTE the basic tool is the RTD. The advantage of RTD as opposed to earlier generation PTS is that RTD is GUI based development environment that can speed up development and very little knowledge of test script development environment like TTCN-2 and TTCN-3 is required. 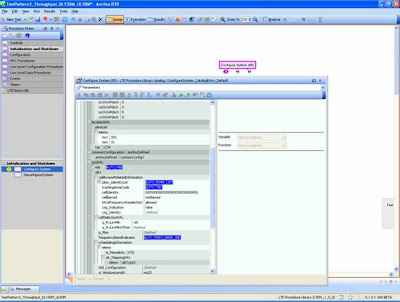 The RTD is a software tool that sits on top of a control PC. It controls the Signalling Tester (hardware) MD8430A. The diagram above shows the setup and connections of different components. 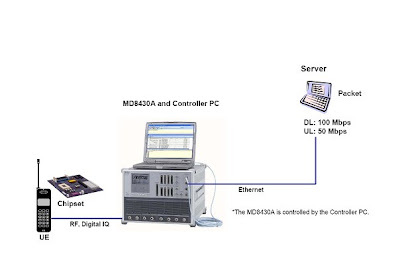 The hardware (MD8430A) simulates Layer 1 (PHY), MAC, RLC and PDCP. 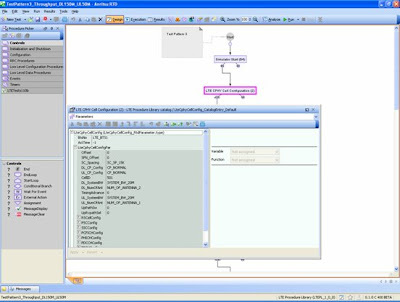 The software (RTD) is used to simulate RRC and NAS. When the tool starts up you are offered typical options as in case of any software. Once you have clicked on new test and provided it with a name, you are up and creating your own scenario. The simple procedures already have a name defined but you can start giving meaningful names to complex procedures. Each name signifies the action it will be performing. 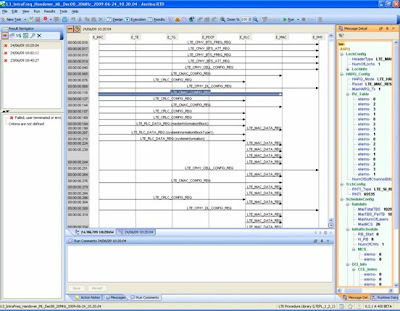 For example Cell Configuration will be used initially to configure the parameters of the cell. Clicking on the Cell Configuration will provide you with the possible options that can be used to configure the cells like the SFN Offsets, etc. All the channels that are necessary for a cell can be configured here. And try sending some message like RRC Connection release. Didn’t quite work because it’s not in the right sequence but just shows the ease with which things can be done. This is run time result of one of the test cases. "The MD8430A is being used by LTE chipset manufacturers to ensure the quality of their products, speed time to market, and reduce design and production test costs." - Wade Hulon, Vice President and General Manager of Anritsu Company, Americas Sales Region. Its nearly three years since I wrote an FAQ on UMTS Testing. So when I got my hands on this book the other day, I so wanted to read it. It would be a while before I manage to go through the book in detail but my initial impression is that this book looks quite good. There is a chapter explaining each of these. The Conformance testing is of interest to me as I have been involved directly and indirectly with this for quite some years now. The book explains the process, standards required and submission of tests to GCF/PTCRB. For those whom testing does not hold much charm, they can gain greater understanding of the concepts by reading Part II of the book. One thing I really liked in this book is that the diagrams explain the concepts very well. 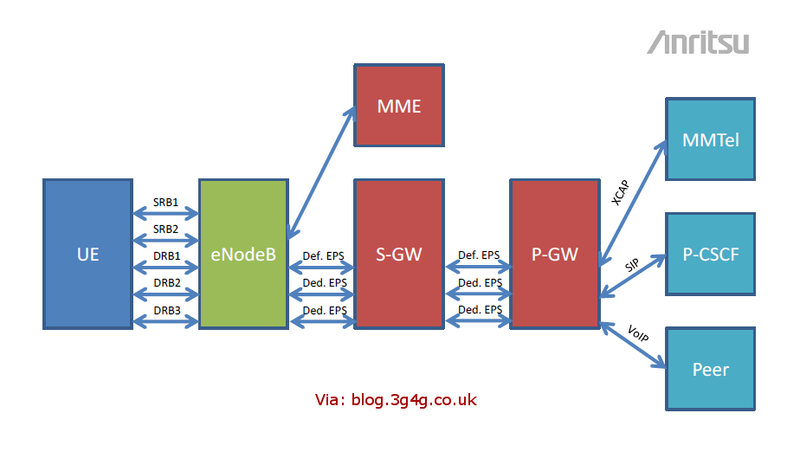 Rather than copying them straight from the 3GPP specifications, they have been improved and re-done by the author. Basic things like 'Dynamic TFCI selection' and 'Layer 2 transport channel processing flow for the 12.2 kbps RMC' are explained clearly using the diagrams. There is just the right amount of detail in the chapters for Physical Layer, Layer 2 (MAC, RLC, PDCP) and Layer 3 (RRC, NAS). Further chapters show message flow sequence charts explaining things like 'setting up of speech call' and 'location updating procedure'. 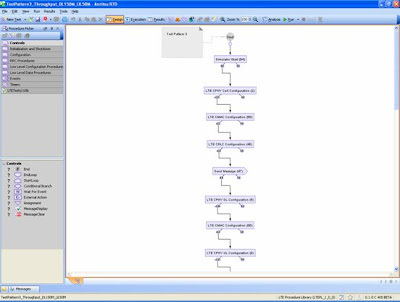 I have some basic sequence diagrams for message flow in the Tutorial section but the ones in the book are comparatively more detailed. The book mainly covers UMTS, with an introduction to HSPA. It would be worthwhile to have the next edition covering LTE in detail. The main reason being that there are lots of changes in the case of LTE. The Air Interface has changed, the channels are different. The NAS messages and entities are different. UMTS (and HSPA) use TTCN-2 for testing but LTE uses TTCN-3. UMTS does not use MIMO (MIMO available for HSPA from Release 7 onwards) but LTE would generally always use MIMO. Overall, this seems to be a useful book and I am looking forward to reading it in detail.